The Suncast ELEMENTS Loveseat with Storage makes for an excellent outdoor storage bench and in our opinion is a great buy. It’s made from durable weatherproof resin and has a stunning high-end look while still being extremely comfortable. 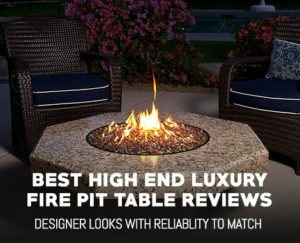 Add onto that the sizable 23 gallon storage box, wind resistant lid and reasonable price tag and you’ve got a wonderful piece of outdoor furniture. Plus, you can grab the whole set to provide a ton of extra outdoor storage and have a beautiful cohesive look. One of the many great things about the Suncast Elements Loveseat is its superb rugged and durable design. The unique material holds up very well to the sun. Even in the hottest of conditions it performed like a champ. 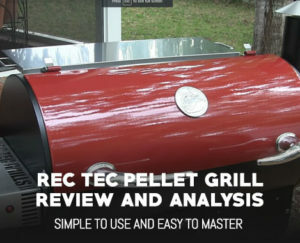 Plus with the durable, thick resin construction it has an excellent 450 pound weight capacity and is clearly built to last. Unlike the Keter Eden Outdoor Storage Bench we’ve previously reviewed, the Suncast Bench does not feel flimsy at all. We had no issue trusting it to hold two full sized adults and a dog to top it off. Another great thing about this storage bench is the resin material is totally waterproof and won’t absorb any damaging moisture. This means no mold, no corrosion and no pitting. While real wicker may look a bit nicer, it has nothing on the sheer durability of molded resin. Even better, the Suncast Elements Loveseat is super easy to clean. Just grab a damp cloth and wipe it off. Better yet, just give it a spray with a garden hose for even easier cleanup. If you love the sitting outside under the rain, check out our reviews of the best hardtop gazebos. We were also very pleased with the wind resistant lid design. A few other models have an issue with the lid flapping in the wind. Thankfully that isn’t a problem with the Suncast Element Loveseat. The lids slides outwards and upwards to prevent any unintentional movement. The downside is that it’s a bit harder to open. However, once you’ve done it a few times, it’s hardly an issue. 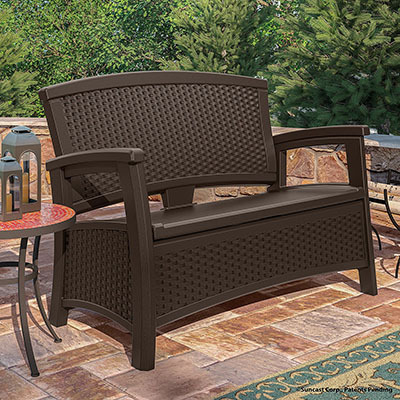 One of the more important aspects of any piece of outdoor furniture is the exterior dimensions. The Suncast Elements Loveseat measures in at 47″ wide, 29.75″ deep and 35.5″ tall. At 17” from the ground to the seating surface, we found the outdoor bench to be the perfect height and was easy to get into and out of. Also, we were pleased with the 4-½” of ground clearance. Small legs help to elevate the outdoor storage bench so it can easily clear raised areas, hoses and other patio equipment. The seating area itself is 41” wide and 19” deep in case you want to purchase cushions or determine seating requirements. Prior to assembly you’ll want to have a Phillip’s head screwdriver on hand to attach all the bolts. However, we recommend that you get a cordless drill instead as it’ll make your life a lot easier. Assembly is fairly quick but can be a bit tricky at times. We got about halfway done assembling the unit before we broke down and pulled out the drill and were we glad we did. When the Suncast Elements Loveseat with Storage arrives on your doorstep it’ll come in a single large box. Inside you’ll find 7 pre-formed resin wicker pieces and assorted plastic bolts for assembly. Even at first glance we could tell the plastic bolts were nice and thick, clearly up to the task. We’re not a fan of flimsy fasteners especially if they will be used in an outdoor environment. Once all the pieces are laid out, you can expect the assembly process to take right around 20 minutes. If you’re using a drill you might be able to shave a few extra off as well. We did note that some of the holes aren’t pre-drilled so it’ll take a bit of effort to screw the fasteners in. However it makes for a super stable base and we are sure it’ll be able to take a ton of weight. When assembling make sure to pay careful attention to the included instructions. Some of the pieces, particularity the metal bar are a bit tricky to get in the right place. However, overall the assembly was fairly straightforward and quick. Another great thing about the Suncast Elements Outdoor Storage Bench is it can easily be disassembled for storage or moving. As with any outdoor storage bench, the under seat storage box is an important feature. With 23 gallons of storage capacity, you’ll have more than enough space to hold all of your outdoor items. We were easily able to fit 8 towels inside making this great for a pool storage bench. Due to the sloping design, the box measures 8” high at the front and 6” high at the rear. It has a large 41” wide by 18” deep bottom for superior storage capacity. While it isn’t quite as large as the Suncast PB6700 Patio Bench or the Keter Eden Outdoor Storage Bench it is far superior in terms of looks of the former and durability of the latter. Plus, the lid keeping it shut is nice and thick which provides a firm seating surface. During our simulated hose rain tests we found the Suncast Elements Storage Box to be water resistant but not water proof. So if you’re planning to keep towels or fabric in there, just make sure the bench is under a patio umbrella or better yet a retractable awning for some additional protection. The defining feature of the Suncast Elements Loveseat is really how beautifully and comfortably designed it is. The faux-wicker provides a wonderful outdoor feel and even without cushions the storage bench is exceptionally comfortable. 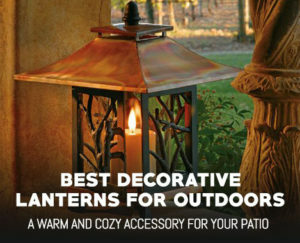 Plus, it’s available in three different colors to match outdoor decor. Even more, it doesn’t even look like a storage bench, it just appears to be a high end piece of outdoor furniture. If you’re planning on adding some outdoor cushions to it, the following two make for awesome choices to finish off the design. The comfortable design is in part thanks to the ergonomic aspects and the contoured air cushion back. The back provides excellent lumbar support and doesn’t press uncomfortably into your spine. Plus, due to the way it’s designed, it has a slight flex to it that helps conform to your body shape. Furthermore, the seat slopes backwards to keep you from constantly sliding downward. It also stops your outdoor cushion from slipping off when you get up. We can’t tell you have annoyed we are having to constantly readjust our seating position and are exceptionally pleased about this feature. The Suncast Elements Loveseat also comes with built in armrests. While they aren’t quite wide enough to set a drink on they are perfect for leaning on and relaxing after a long day. Another great reason to buy this specific bench is there is a ton of matching Suncast Elements storage furniture available to go with it. For convenience we listed what other pieces are available so you can grab the complete set. 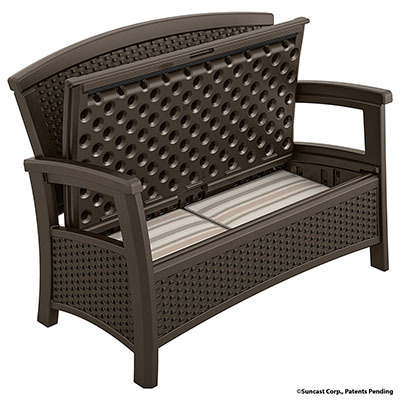 In Summary, the Suncast Elements Loveseat with Storage is an excellent patio addition. The resin material is perfect for the outdoors, while the ergonomic design makes it extremely comfortable. The 23 gallon under seat storage is super handy and the robust lid is clearly built to last. Overall, you’ll be hard pressed to find a better outdoor storage bench. When you buy the Suncast Elements Loveseat we can guarantee you’ll be happy with your purchase and it’ll look stunning on your patio.